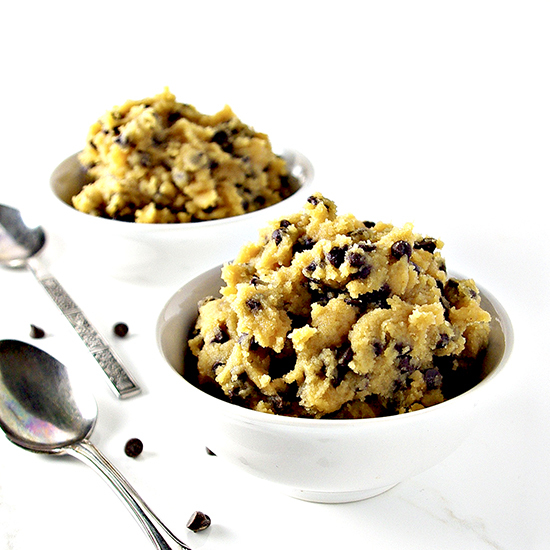 Can we please talk about cookie dough? It is my life. It is the reason I never meet the projected yields on the cookie recipes. The recipe card says it yields 60 cookies. “60 cookies, my foot,” I mutter with my mouth full of cookie dough. Ya’ll we may be the household full of all the allergies, but that does not mean we will only eat kale, and nothing but the kale, so help us God. In that same 60-cookie recipe, and in all the years of trying to make them (snickerdoodles, maybe? ), I never successfully made it past 24 baked cookies. Hand to God. Actually, someone should probably call Jesus and ask him to fix it because I really am addicted to the cookie dough more than the finished product, and I cannot save myself. Also, am I the only one who gets winded when she’s making cookies? Like, I get the batter ready to be baked, and that part’s fine. But then I have to plop the dough on a cookie sheet and then bake the cookies for 10-12 minutes. And THEN I have to remember to not let the cookies burn? Some days just folding in the flour is all I can handle before my energy bank taps out. Who can handle that level of inertia and complexity? Well, not me, apparently. And so I just eat the batter and bake four cookies instead. 60 cookies? Who even has time for that ish? 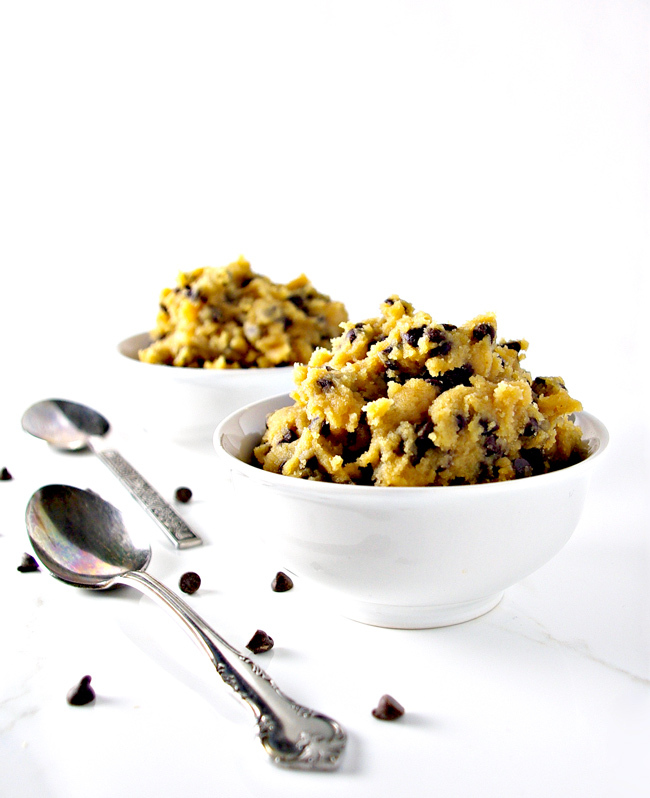 So, today I bring you Edible Cookie Dough. It is amazing. It is ready in 5 minutes. And you will not be exhausted from making it. Also, depending on which sweetener you use, you can make this no-bake dessert recipe vegan or paleo! 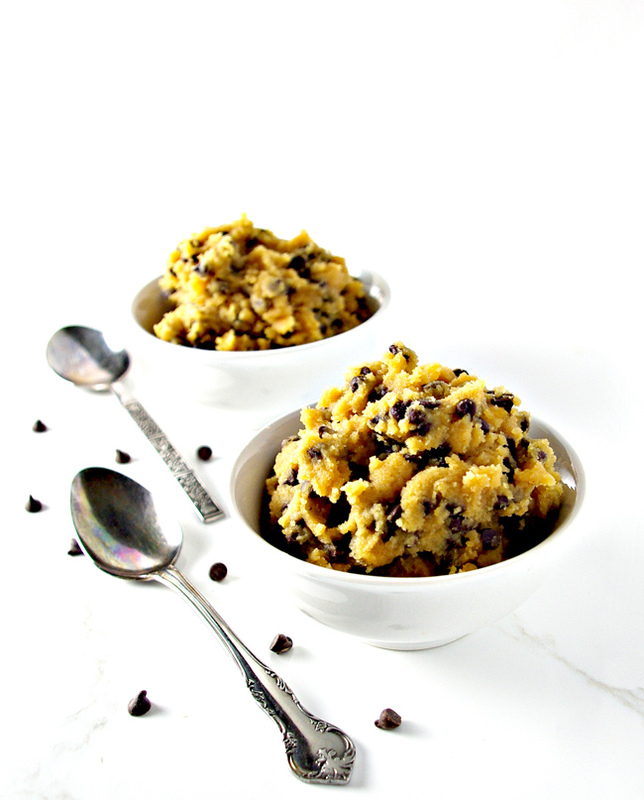 Edible Cookie Dough is also perfect for two, but you might not want to share! Don’t worry, I won’t tell anyone, ‘cause I’ll just be over here scooping my dough and living my best life. Below are the ingredients to make your very own Edible Cookie Dough! Dry ingredients. Almond flour, coconut sugar, a pinch of sea salt, and your choice of mix-ins. I gravitate toward chocolate chips (I like Enjoy Life brand chips). But you can also add in mixed nuts, macadamia nuts, or dark chocolate pieces. Wet ingredients. Coconut oil, almond milk, vanilla extract, and your choice of sweetener. I typically go for agave nectar (which is vegan). But you can also choose from maple syrup (vegan or paleo) and 100% pure honey (paleo). Because the sweetener plays such a critical part in this gluten-free edible cookie dough recipe, it’s important that you select a sweetener YOU will enjoy. The same rule applies for the dairy-free milk you choose. I like almond milk because it’s a fairly neutral flavor that blends well with this recipe. But if you don’t like or can’t have almond milk, then coconut milk, rice milk, or cashew milk would also work. 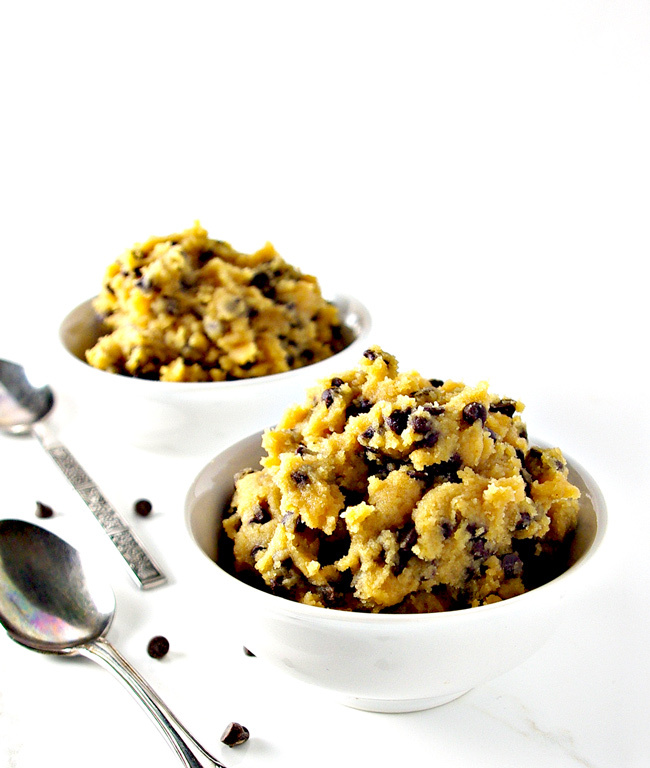 It’s easy to make Edible Cookie Dough. The key is to add the coconut oil to the flour before adding the other liquids. Doing so makes the stirring much easier to do. If you’re in the mood for other no-bake dessert recipes then check these out!